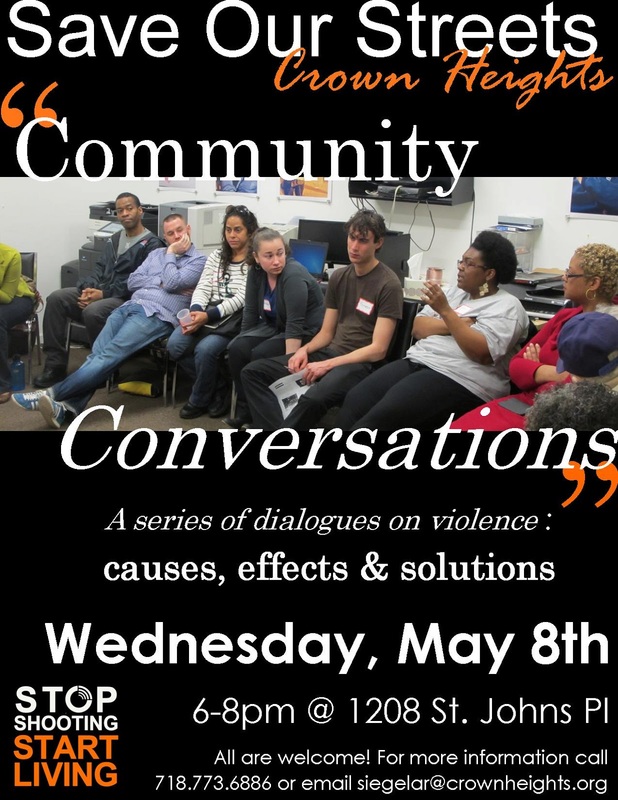 Save Our Streets (SOS) Crown Heights hosts their second community conversation tomorrow night from 6-8pm at the Bethany Methodist Church, 1208 St. Johns Place in Crown Heights. This is a great opportunity to learn about the hard and vital work of violence prevention that SOS is engaged in, and to think about how all of us can contribute to it. 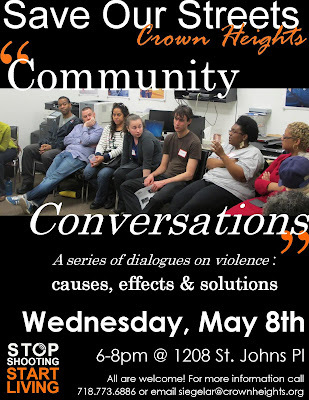 After the shooting on Franklin Avenue two weekends ago, none of us should be complacent about the threat of gun violence in our communities (and I urge the anonymous posters from the linked thread who suggested the community does not "step up" about gun violence to go and educate yourselves about this community-based effort to do just that). Complete details are on the flyer, above, and at their website. Can somebody explain to me why it's so necessary to have affordable housing? I deal with the fact that I can't live every where I want to live. Isn't that just part of life? I think you meant to post this on the zoning thread, right? Briefly, I think there are immediate concerns about preserving and creating affordability in gentrifying neighborhoods, specifically to limit the trauma of displacement, which breaks up formal and informal institutions and social networks in ways that harm individuals, families, and communities as a whole (even those moving into them). There are also broader questions in play: whether the segregation of cities by class (which often corresponds with race in the US) should be resisted or ameliorated in some way, whether the real estate market, as currently structured, is the best way to allocate land and resources to people, and the like.